I’ve always loved coconut. I can remember my mother baking coconut cakes and letting me eat shredded coconut straight out of the bag she kept in the freezer. Yeah, that kind of coconut love. It’s not news to many of you that I married a coconut hater. Sure, I give away so much of what I bake, but I still feel a bit bad if I bake something Quinn won’t eat at all. So, now my coconut desserts are few and far between, and I think I enjoy them even more. Absence makes the heart (er… taste buds?) grow fonder, right? I have had this pound cake recipe bookmarked for ages. That happens a lot around here, leaving me with stacks of recipes I’ve been meaning to bake for years. But, I digress. Anyway, I was on a pretty serious baking spree recently and thought that with all the other baked goods in the kitchen, it was a good time to break out the coconut. The cake itself is fairly simple. 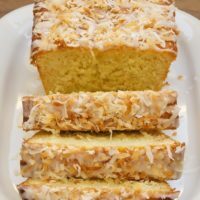 It’s essentially a pound cake with some toasted coconut mixed into the batter. It’s perfectly delicious just like that. But, the glaze really makes it something special. That glaze is simply a mixture of buttermilk and confectioners’ sugar. That’s it! 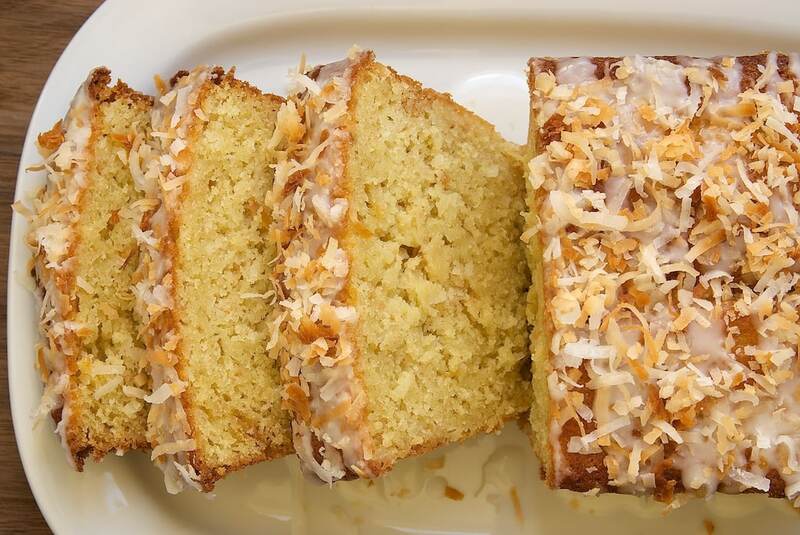 Then, of course, a bonus sprinkling of toasted coconut makes the cake both beautiful and extra delectable. A sweet, toasted coconut twist to classic pound cake. Line a small baking pan with aluminum foil or parchment paper. Spread the coconut in an even layer on the lining. Bake for 6 to 8 minutes, stirring every couple of minutes to prevent burning. Remove from the oven when the coconut is lightly toasted. Set aside 1/4 cup of the coconut to use for the topping. Using an electric mixer on medium speed, beat the butter and sugar until light and fluffy. Add the eggs, one at a time mixing well after each addition. Mix in the vanilla. Reduce mixer speed to low. Add the flour in three portions, alternating with two portions of buttermilk. Mix just until combined. Stir in the toasted coconut not reserved for the topping. Transfer the batter to the prepared pan and spread evenly. Bake 1 hour, or until a pick inserted into the center comes out with a few moist crumbs. Cool the cake in the pan on a wire rack for 1 hour. 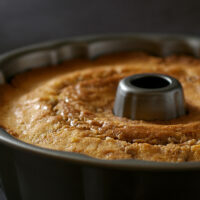 Then, remove the cake from the pan and allow to cool completely on a wire rack. Whisk together the confectioners’ sugar and buttermilk until smooth. Drizzle over the cooled cake. 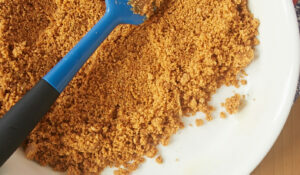 Sprinkle the cake with the reserved toasted coconut. *I have updated this from the suggested 4 & 1/2″ x 8 & 1/2″ pan, as many of you have said that you needed a bigger pan. I used the smaller size without incident, but the larger size is a safer bet. Sometimes life just isn’t fair. I married a nut hater. I’m in love with coconut and my hubby likes it too, so this is a must in my household!! Yah!! I,too, married a coconut hater and I love the stuff. I feel your pain. Sometimes though, you just have to bake something for yourself. The only thing better than coconut is toasted coconut! I never met a coconut dessert I didn’t like and this one looks absolutely wonderful. 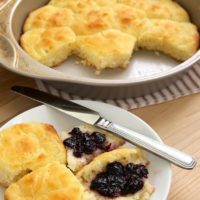 Love the idea of buttermilk in the glaze, too. I can’t get enough coconut! I love coconut too. I don’t get why people dislike it but I think it’s a texture thing. Oh well, more for us who like it! I have more recipes than I have time for. Oh, how I wish I could be a full time blogger. 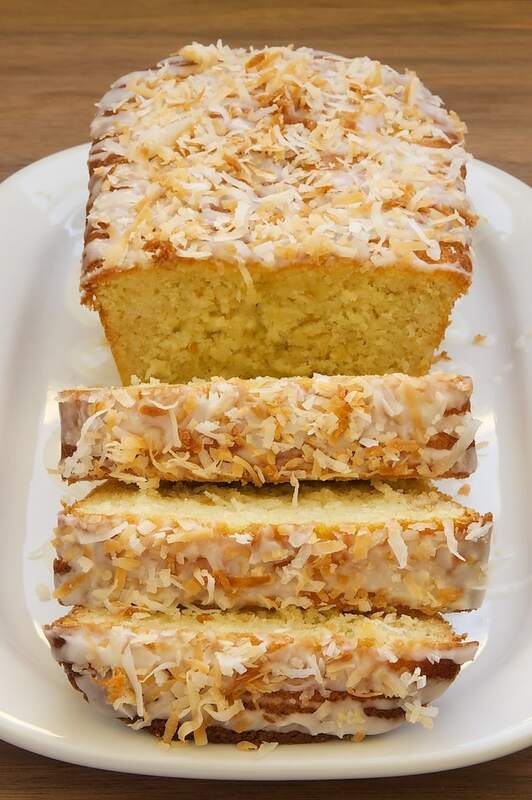 This coconut loaf looks wonderful. I may whip up a loaf to take to my grandparents this weekend. Yum! I do love all recipes that include coconut. The pound cake looks deliciously moist, too. I grew up with plenty of coconut, and love it like mad. That would be so hard to have a coconut hater in the house. Friends of mine hate it so I have to remember never to add that to things I bake for them! This cake looks so moist and delicious, and the buttermilk glaze sounds very unique. Coconut love! We should make a our-significant-others-hate-coconut support group!! I never make anything with it because Mike won’t eat it. Shame. Because I so want this in my life. My husband is not a huge fan of coconut but sometimes I can sneak it in! This cake looks absolutely delicious! I love a good pound cake recipe. My husband LOVES coconut. This would be a huge hit with him! Coconut is a favorite of mine. 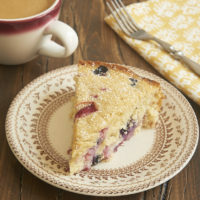 This looks absolutely delicious and great to have with a hot cup of coffee right now! Thanks for the recipe. I have a practical question, ‘Cool cake in pan on wire rack for 1 hour’ – does that mean turn off the heat and leave it in the oven? Thanks! Kristina, you’ll need to take the cake out of the oven when it’s done and place it on a wire rack that’s on your counter. Then, let the cake cool there for an hour. No, out of the oven. I also love coconut. This pound cake looks perfect! You didn’t put the oven temperature so I’m guessing 350. Is that correct? Hi, Dorothy. It is 350°. It’s in the first step of the directions. Recipe as prepared is too much batter for the size pan specified. I have one in the oven at this moment, dripping batter into the bottom of the oven. I would not make again without using a 9 x 5 loaf pan. A 9×5 pan as there is just too much batter for an 8×4. Not sure there is enough batter to use a bundt pan either. I also think the oven temp should be lowered perhaps to 325. Most pound cakes that I have made use either 300 or 325 as you are baking for almost an hour. The batter looked rich and yummy and I am anxious to taste the finished product which I am taking to a church meeting in the morning! Your coconut bread looked amazing so I had to try it for a party tonight. I usually check all comments before baking anything, but am pressed for time today. I poured the batter into the loaf pan and while it looked way too full, I went ahead anyway. I checked on it at 35 minutes and the batter had overflowed all over the bottom rack and the bottom of the oven. I thought…well, I have to keep going…at this point the house is all smoked up and each time I check on the bread the oven is full as well. I have the fans all going on high speed and the back door and windows opened. I just checked the comments, as well as the Marta Stewart ones and it looks as though others have had the same problem. I would like to add – in my opinion – a larger loaf pan would definitely work better for this recipe. 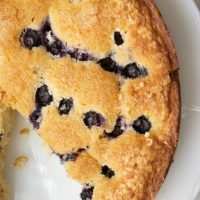 I made this recipe exactly as stated in a 9×5 heavy glass loaf pan, which somehow seems to hold more content than a similarly labeled non-stick loaf pan. The cake tasted great and looked as it did in the blog photos. The cake is actually better on the second day. It’s moist with a nice crumb. The tartness of the buttermilk glaze is a nice counterbalance to the sweet cake. I made this in a 9×5 pan and my oven is a mess! Either I did something wrong, or even a 9X5 isn’t large enough. Would this work in a bunt pan? 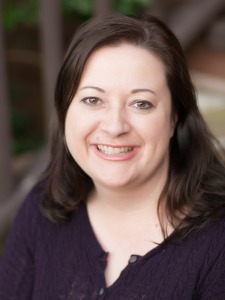 Hi, Cheryl. I’ve not tried it in a Bundt, but I think it would work. Any adjustments in scale would depend on the volume of your Bundt pan. This cake is absolutely fantastic. 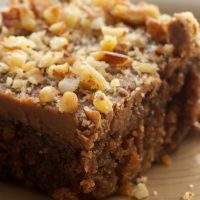 I am a fan of coconut and this cake melted in the mouth! I am wondering if I can use brown sugar instead and chop it down to 3/4 cup ( the original loaf was too sweet) and if I can use untoasted coconut ? Hi, Selena. 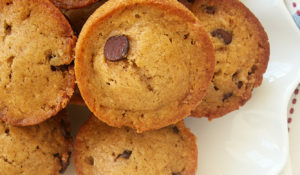 You can substitute brown sugar. 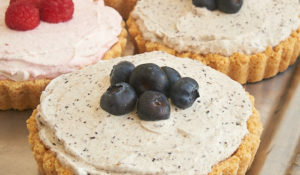 Reducing the amount of sugar is fine, although it may affect the texture of the cake. Untoasted coconut is fine, too, although I highly recommend toasting it for the flavor it adds. I just baked this loaf today. I used half white sugar and half brown. I used margarine not butter. I added one teaspoon of coconut extract , with the 1 tsp of the vanilla extract. I added chocolate chips and also walnuts. I made my own chocolate frosting for the top. I split the batter into two loaf pans and baked 60-70 mins at 330 degrees. The loaf came out moist and delicious. The family and my friends demolished it , I had two slices ! This recipe helped me a lot! great recipe, add in what you prefer as I did. Oh my! Delicious! I had leftover buttermilk and shredded coconut from Christmas baking…and wanted to use them both up. Googled recipes for “buttermilk and coconut” and found yours. This will most definitely be a keeper and included in my baking recipe binder. I too added some coconut extract because I had some to use up. Do you ever bake like that?! Thanks for the great recipe! I’m happy to hear that! 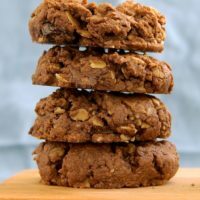 I love the idea of adding coconut extract for even more coconut flavor!